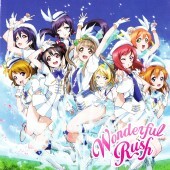 This CD+DVD package contains songs and audio drama for the Love Live (ラブライブ) School Idol Project. Songs by the seiyuu group Muse (μ's). This is the 5th CD single released by Muse.